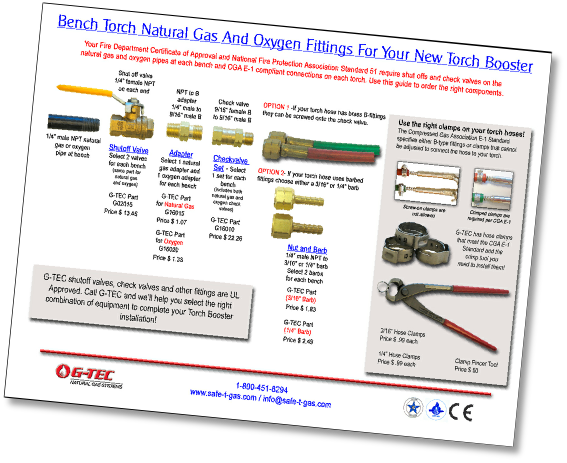 TB-15 and TB-30 Torch Boosters require a minimum 1/2” diameter low pressure natural gas supply pipe. TB-60 requires a minimum 3/4” diameter supply pipe and TB-125 requires a minimum 1” diameter supply pipe. 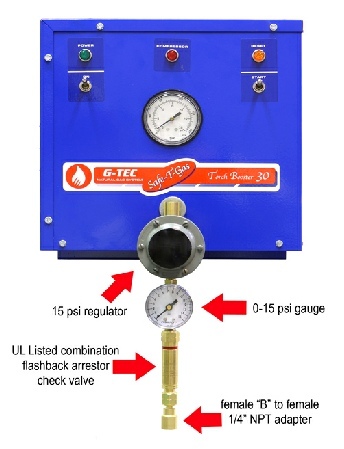 A qualified technician should install a tee in the existing gas line with a 1/2” male fitting for the TB-15 and TB-30, 3/4” for the TB-60 and TB-125 Torch Boosters. Do not attempt this installation yourself unless you are a Licensed Master Plumber. When connecting the regulator and gauge to the Torch Booster use sealant tape on the high-pressure outlet fitting on the Torch Booster. Be sure to hold a wrench on the high pressure outlet fitting when screwing on the regulator to relieve pressure on the fitting. Failure to do so may result in twisting the internal piping and will void the warranty. arrestor check valve to the regulator. This is a general description of how to install TB-15 through TB-125 Torch Boosters - please read the User’s Information and Installation Manual that is included with with your Torch Booster for complete installation details. New York City has specific installation, permit and operational requirements which must be met - please refer to the User’s Information and Installation Manual which comes with the Torch Booster for details. It is your responsibility to comply with all New York City Codes, Rules and Regulations. 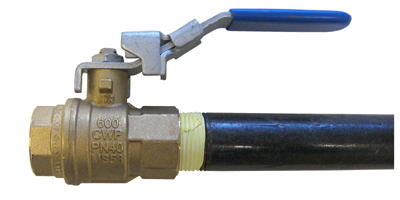 Torch Boosters must be installed by a Licensed Master Plumber; do not install a Torch Booster in New York City unless you are a Licensed Master Plumber. 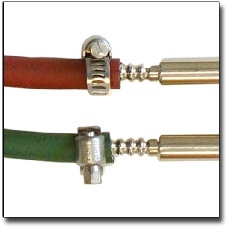 You must use the stainless steel hose supplied by G-TEC. Do not substitute any other hose, hard pipe connection or anything else. Safety equipment inside the Torch Booster is calibrated to this hose and anything else will cause the system to shut down without warning. You will need two wrenches for this step. Use a 9/16” wrench on the nut at the end of the hose for the TB-15/30/60 or ¾” wrench for the TB-125, and a 5/8” (TB-15/30/60) or 3/4” (TB-125) wrench on the nut attached to the cabinet. When tightening the fitting hold pressure on the cabinet nut so that it does not turn. - Press the START button on the right side and hold it down until the amber RESET light goes out - the red COMPRESSOR light in the middle stays on. The Torch Booster will now continue to run by itself. If the START button is released before the amber RESET light turns off the Torch Booster is designed to shut itself off. - If the Torch Booster shakes at startup, quickly turning on and off, it means there is not enough gas flow to the unit. Continued attempts to start the Torch Booster in these conditions can damage the unit - call G-TEC at 1-800-451-8294. - To turn the Torch Booster off press the ON switch on the left side down. - On the right side press and hold the black START button until the RESET light above it goes out - the COMPRESSOR light in the center stays on. The Torch Booster will now continue to run by itself. If the START button is released before the amber light turns off the Torch Booster is designed to shut itself off. - To turn off the Torch Booster press the red button below the COMPRESSOR light. Now test all hose and fitting connections with soapy water to be sure there are no gas leaks. Purchase a Torch Booster from Gesswein, Landa International, Otto Frei or directly from G-TEC if you don’t have an account with one of our Distributors. Jeweler calls the NYC Fire Dept. at 718-999-1510 to arrange final inspection for permit. When all inspections are complete then the Torch Booster is ready to use! Fire Dept. 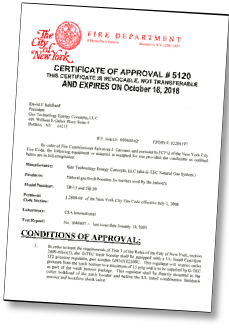 sends a draft Certificate of Approval to G-TEC. This draft is reviewed with the business owner or person in charge of the facility to explain conditions. The representative is required to sign a statement acknowledging review of the draft Certificate of Approval which is sent to the Fire Department then a final Certificate of Approval is issued. Licensed Master Plumber installs the Torch Booster - the system cannot be installed until the Fire Department has issued the draft Certificate of Approval. Jeweler calls the Fire Dept. at 718-999-1510 to arrange final inspection for permit. When all inspections are complete the customer may begin using the Torch Booster in daily production. 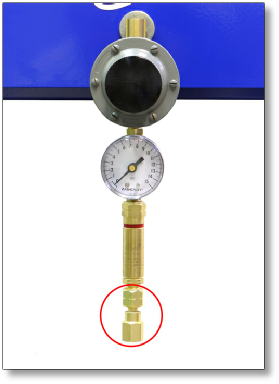 How low pressure natural gas is supplied to the Torch Booster and how high-pressure gas is delivered to the torches, including all valves, check valves and other fittings required by NYC Codes, Rules and other Regulations. The fire rating of the rooms that are situated directly adjacent to the designated natural gas Torch Booster room, including all applicable safety features such as fire protection system, mechanical ventilation, gas detector(s), or alarm system that is installed in the workshop. Fire Dept. 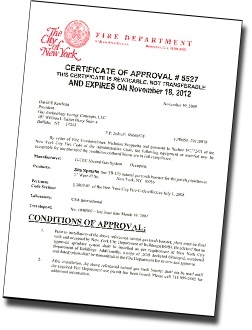 requirements for the Certificate of Approval. Call G-TEC at 1-800-8294 if you have questions about what the Fire Dept. requires for this drawing. The Fire Department Certificate of Approval calls for shutoffs, check valves and fittings at each torch which conform to National Fire Protection Association Standard 51 and Compressed Gas Association Standard E-1. as well as a simple check valve. TB-250 and TB-500 Torch Boosters are hard piped to the utility gas supply and require a minimum 1 1/2” diameter supply pipe. 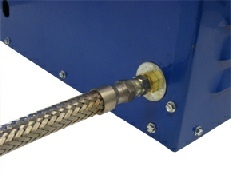 Narrower pipe will reduce gas flow volume through the Torch Booster. 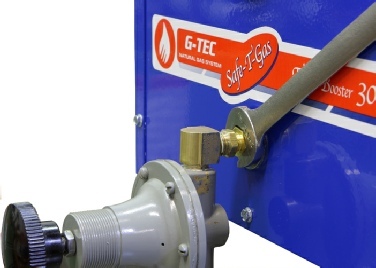 G-TEC Torch Boosters are manufactured with two gas inlets for gas supply pressure of less than 1 psi or 1-5 psi. 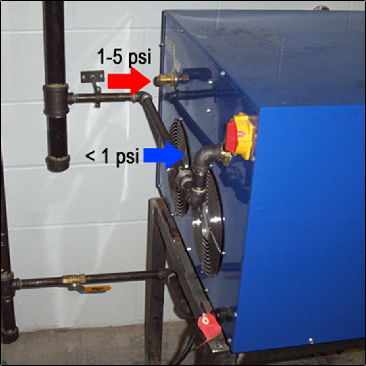 In New York City all utility gas pressure is less than 1 psi so connect the supply pipe to the inlet closest to the red/yellow power shutoff. The 1-5 psi inlet should be capped with a metal cap and sealed with Teflon sealant. Power supply to the Torch Booster should be 208V, single phase 30 amp service. Uses a Buck & Boost transformer to provide proper power supply if it is not readily available. Higher or lower voltage will cause burning and melting in the electrical cabinet and void the warranty. Torch Boosters should be installed with 12” space on all sides for cooling air flow and to allow access for annual scheduled maintenance. We strongly discourage installing the Torch Booster under a cabinet or where a ladder is needed to reach it. Connect a regulator-mount flashback arrestor check valve to the regulator. Do not use sealant for this connection. 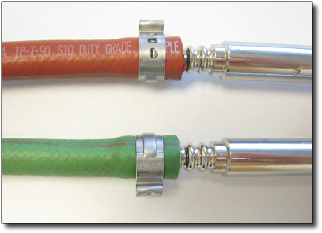 If you purchased one, connect the B to NPT Adapter to the end of the flashback arrestor check valve for connection to the pipe going to the jewelers’ torches. 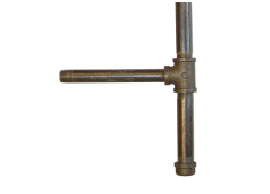 At each bench on the natural gas and oxygen pipes there must be a UL Approved shutoff valve as well as a simple check valve. 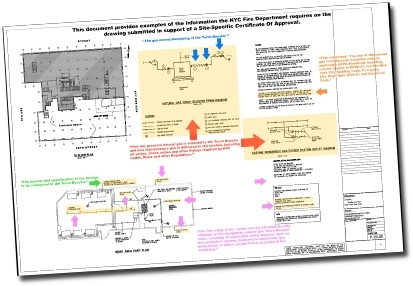 Before submitting a drawing to the Department of Buildings for permit approval send a PDF of the drawing to Ed Howard at ehoward@gas-tec.com to be sure this information is correctly portrayed for the Fire Department. The Fire Department will require a DOB Approved drawing with this information in order to issue a Site Specific Certificate. If the DOB Approved drawing submitted to the Fire Department does not contain this information in the proper format it will be rejected.